Wildlife challenges at Disney World, originally uploaded by Erin *~*~*. When a mama duck will parade her children past a crowd that is only 6 feet away, it’s time to relocate the family. These ducks are simply too unafraid of humans and this leads to encounters with humans that are not safe for anyone involved. 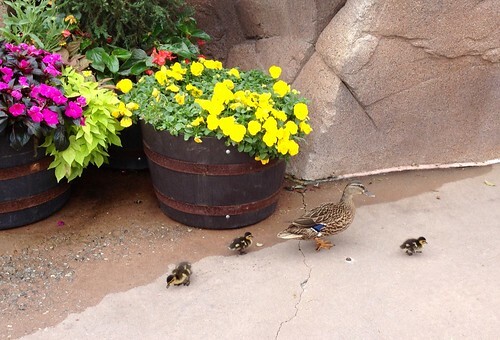 This morning on Walt Disney World property, I witnessed parents and children alike persisting in chasing ducks down, trying to pet them, and then "OUCH – hey it BIT me!". More signs and more Cast Members are needed to educate and intervene. Please, Disney – you used to be better at this! Don’t wait until someone gets hurt. And yeah, "someone" includes the animals. Practice a little risk management while making the World a little safer for the wildlife that lives and breeds on YOUR property. You can do this – don’t let me down!